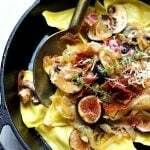 Caramelized Figs Crispy Prosciutto Mushroom Ravioli sounds like a dream and it is! Meanwhile heat a cast iron skillet and give it a quick oil spray. When hot add in the prosciutto slices and cook for a 2-3 minutes on each side. This process is very similar to cooking bacon. When done place crispy prosciutto slices over a sheet to paper towel to absorb the extra grease. Meanwhile, heat oil on a large skillet. Add onion slices and sauté until translucent (about 3 minutes). Add mushroom and fig slices, continue to sauté stirring often until mushroom and fig are starting to soften but not quite mushy. Add wine and fresh sage. Simmer on low for about a minute. Then add the ravioli folding ingredients carefully. If needed add more olive oil. When ready to serve top with crumbled prosciutto and serve with a generous amount of parmesan cheese.